First and foremost, congratulations! We love being part of such a special day and we appreciate you visiting our Bridal Page. This is a very exciting time in one's life and we take pride in making sure your experience at Bukés is wonderful from beginning to end with our customizable bridal packages. Whether you are coming from out of town, have a large bridal party, or simply trying to stay within budget, we are confident that we can accommodate your needs and that you will be satisfied with the performance of the Bukés Bridal Team. To reserve your wedding date with Bukés Salon Spa, please call to speak with our Wedding Coordinator at 630.325.6069 or complete our online Wedding Information Request, and we will reach out to you. We look forward to helping you celebrate your wedding day! Our Bridal Packages include four appointments, beginning with a Meet & Greet to speak with a Bukés Wedding Coordinator and discuss accommodations, number of attendants, secure appointments for your wedding date, and other needs. A Consultation is scheduled for you to meet with your Wedding Stylist and Makeup Artist to discuss your ideal look. The Trial Run includes hairstyle and makeup application prior to your wedding day as well as temporary lashes and/or the airbrush add-on depending on your Bridal Package selection. For your fourth and final Wedding Day appointment at Bukés, relax and have fun with your closest ladies while the Bukés Bridal Team assists in making your special day absolutely perfect! In addition, our brides receive 10% off pre-wedding services at Bukés from the time of reservation leading up to the big day. Recommended services include: Haircut & Style, Compositional Haircolor, Hair Extensions, Manicure, Pedicure, Facial, and Airbrush Spray Tan. Package rates are determined based on experience level of technician and availability of wedding date. Bridal packages start at $415 and require a 25% deposit upon reservation. We reserve a private styling area for wedding parties and invite you to bring a photographer and/or videographer to capture your group getting ready. We also provide complimentary snacks and beverages for parties with five or more attendants. From the flowers to the band, everything was in order for our big day. And when it came to our hair we wouldn't have trusted anyone other than Bukés - Highly recommend for all brides. It was a no-brainer for this amazing salon to cut, color, and style my hair and my (now) husband's hair. 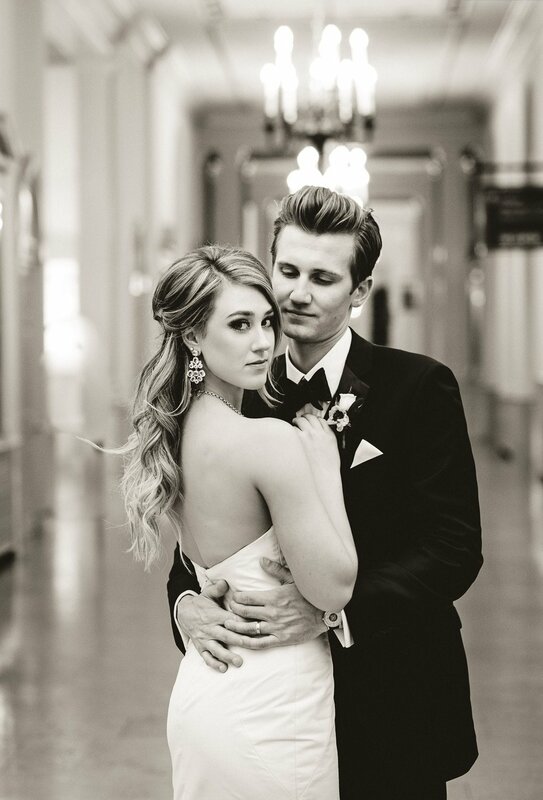 Even though our attire was gorgeous on our Big Day, it was truly our hair that stole the show and made for beautiful, lasting photos. I absolutely loved the updo Priscilla did for my wedding and wanted to thank her so much!! It stayed in all night and not one hair came out of place. All of the girls loved their hair and everyone's stayed so perfectly in place! Also - one of my bridesmaids found her updo for her wedding at Bukés! The stylist that helped her was wonderful! She took a lot of pictures and is having that updo done for her wedding day coming up in October. Thank you again for everything! I used Bukés for hair and makeup for my wedding party and we all loved working with the Bukés team! The staff knows what they are doing for bridal hair and makeup-- they have bridal packages that are easy to customize and the stylists were very responsive to our needs. For parties of five or larger, they will provide snacks and drinks and let you use the back room of the salon to relax in between appointments, creating a much-needed calming atmosphere the morning of the wedding. Highly recommended-- everyone looked fabulous for the wedding!